Vectors have length, direction and angle. In engineering and science, vectors can be moved tip to tail to add forces and create a resultant vector. Vectors are equal if magnitude and direction are equal. Position is arbitrary. 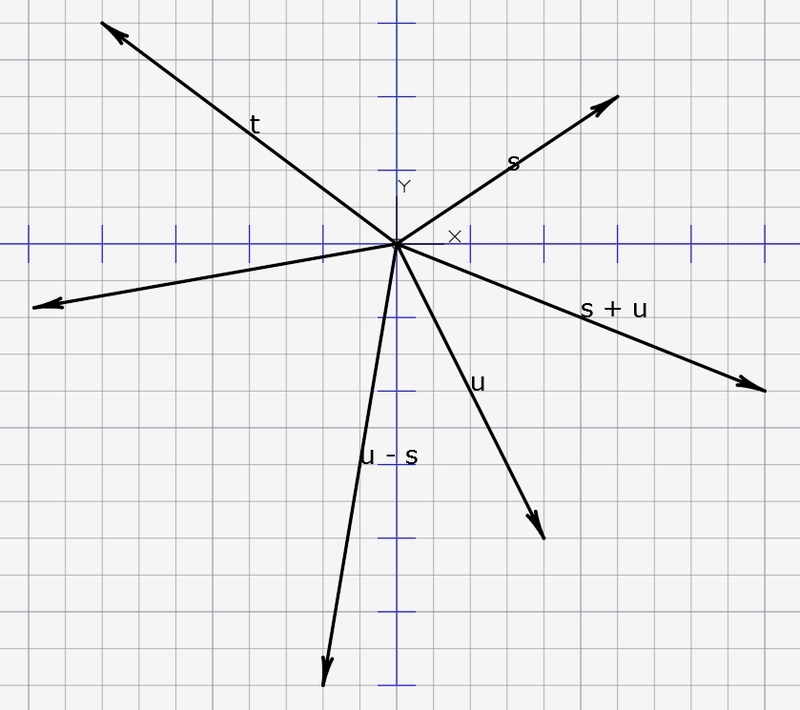 2D vectors can fully describe with one (x,y) pair. When the vector starts at (0,0), the end point is also the delta x and delta y. The autocad line already has everything it needs to be a vector. The direction is saved in separate variables for start and end point. 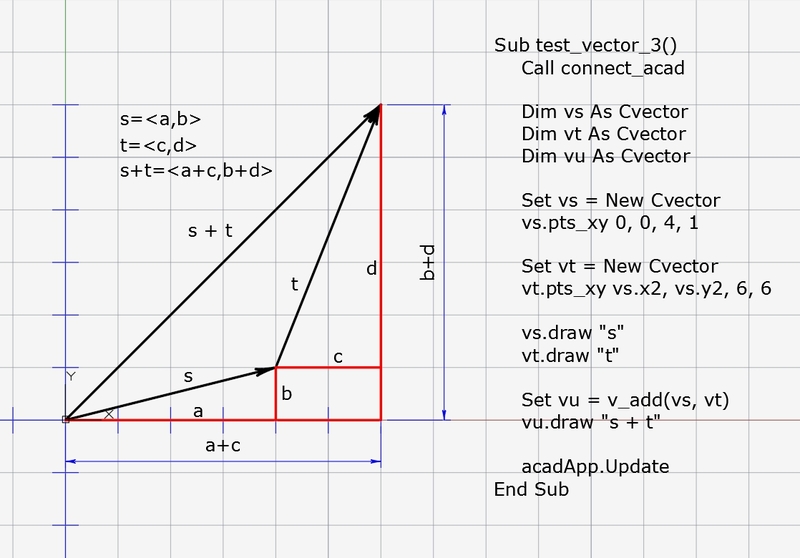 The acadline object in VBA has all the properties required of a vector – StartPoint, EndPoint, Length, Angle and Delta. Delta is the vector. 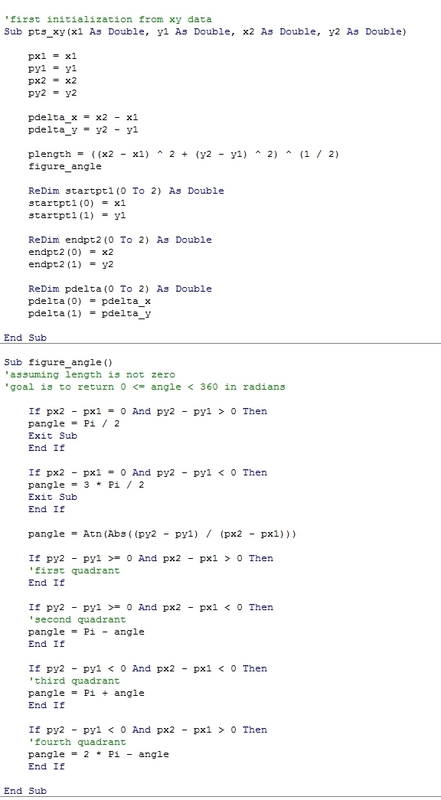 Delta is returned as a 3 place array of doubles, exactly the same as StartPoint and EndPoint, but it’s not a point, it’s (x2-x1, y2-y1, z2-z1). We save it to a variable as if it were a point. We use it to do vector algebra – the algebra of lines. An object vector is given a variable name, such as U, V, W, S or T, usually lower case and bold, and specified to be equal to the delta values. angle brackets (this wordpress is html and it will not allow angle brackets for any purpose other than the one it has in its mind) are used to show (x,y) (imagine angle brackets) is not the same thing as (x,y). Vectors are added by adding their delta values. if u = (ux,uy) and t = (tx,ty) then u + t = (ux+tx, uy+ty). Vectors can also be subtracted and scaled. The angle and length they make can be calculated from the delta. Vectors of different length and angle are easily added to form a new vector with new length and new direction. A great deal of engineering mechanics and physics vector work can be done just by drawing lines of appropriate length and direction and moving the vectors tip to tail, measuring the resultants. The parallelogram rule states that if two vectors are to be added, draw them as adjacent sides of a parellogram, the diagonal is the sum. If 3 or more vectors to be added, they are moved one after the other and the resultant is start point to finish. The math of adding, subtracting and scaling vectors is simple. 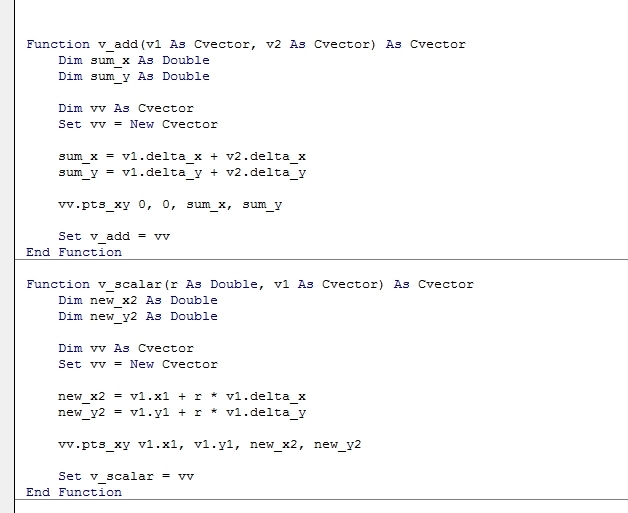 Creating a vector class in VBA allows the formation, properties and rules of calculations to be formalized. This is a first simple draft. In VBA classes, the variables used may be hidden from the user, while the names of property subs are the interface. We use the good names for properties and reference names for the variables. We want (i think) to save all required data even though it is redundant. The angle and length can be calculated from the point values, and vice versa, so they have to be consistent. 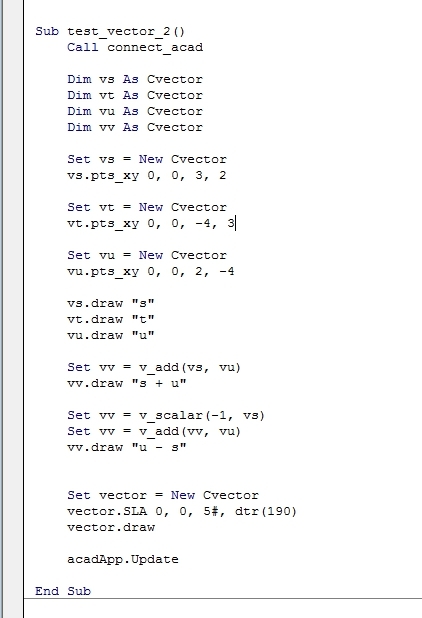 The angle of the vector can be calculated from Tangent of delta y over delta x, but tangent has a period of 180 degrees and vectors rotate from 0 to 360, not including 360, so i wrote a simple program to test in each quadrant. This arrow is not integral. It is a 1-unit long block inserted at the end point of the line at a scale that looks good using the angle of the vector. 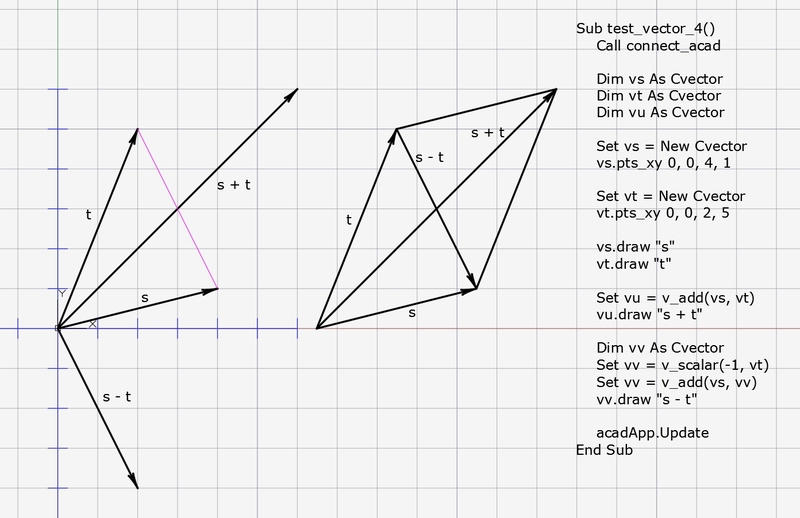 The vector line is full length of course, so on-screen calculations work. The arrow can be erased. A switch could be added in a more polished program to arrow or not arrow. The optional parameter adds a text label at the midpoint of the vector. This is all we need to get started with vectors. The calculation programs are external to the class. Here is a test demo and the autocad output. The math is simple, but we will not be able to use VBA symbols “+ – *” for vector addition, subtraction and multiplication. Those are reserved. Subtraction is accomplished by using a -1 scalar factor and adding the negative vector. Functions return a vector object. We need to set up a vector variable to receive the result. another interesting application of the parallelogram rule is that one diagonal is the sum, the other is the difference.